Range: Found throughout Kansas; least abundant on High Plains. Description: Harmless. 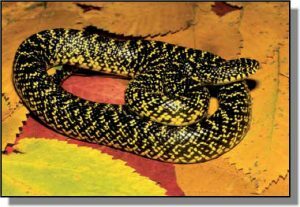 Smooth scales; belly yellow and irregularly patterned with black; black head, body and tail profusely speckled with small yellow, cream or white spots. Yellow speckling on back may fuse to form narrow bars. Young generally same as adults, but yellow speckles nearly always fused to form bars on back. Habits: Inhabits moist areas of open woodland, woodland edge or lowlands as well as open prairie; frequents rocky ledges on hillsides and small mammal burrows in open areas. Active from April to October, primarily during day; nocturnal in summer. Eggs in clutches of 2-17 and generally hatch in fall. Constrictor. Diet includes rodents, small birds, eggs (bird and reptile), lizards and other snakes.